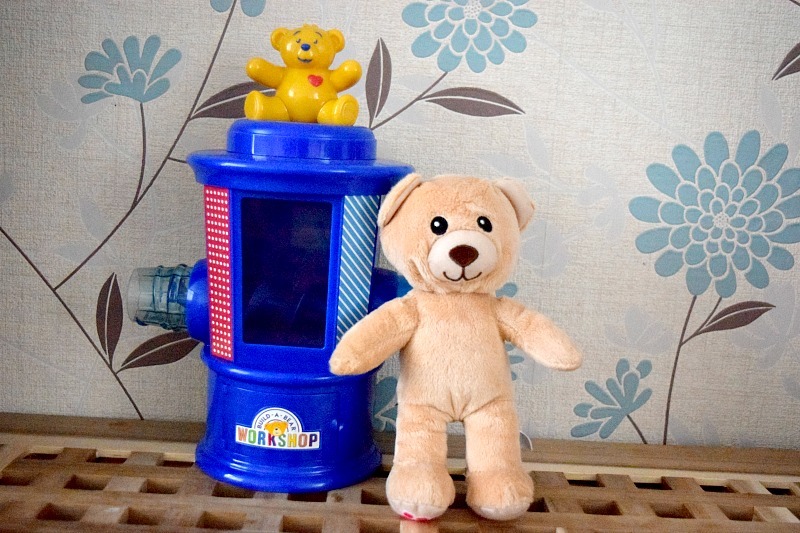 Like most parents of young children, my kids have a pretty impressive collection of Build a Bear soft toys. The excitement when we travel to the Bullring shopping centre in Birmingham is immense as they know that our nearest store is there. Gracie was recently sent the Build a Bear Stuffing Station to review from Spinmaster and I have to say I have never seen her more excited to review an item before. The stuffing station looks exactly like the one in store but on a much smaller scale. The kids love helping the store assistants stuff their bears so to be able to stuff their own at home is very exciting, especially when it looks like they have a mini Build a Bear shop set up. Of course the bears are also smaller than the stuffed toys you would buy from Build a Bear stores, they are more of a miniature size but Gracie wasn't bothered. In fact, she was more impressed with this because she could make them all by herself. After she made her first bear Freddie, she took him into school and did Show and Tell in front of her whole lower school assembly as she was so proud. In store they sew up the stuffed toy once it is stuffed but I find it very difficult to sew with a child so was pleased to see the bears come with built in zips so you can simply just zip it up once stuffed. This is much easier for your child to be fully involved and I liked that I didn't have to attempt a good sewing job. Once you have used all the bits included in the set, you can also buy the bear packs separately to use with your stuffing station. Gracie was also sent a purple kitty set, which she was so excited about as she loves cats! There are several different ones to choose from when buying separately. Gracie really enjoyed using the Build a Bear Stuffing Station. 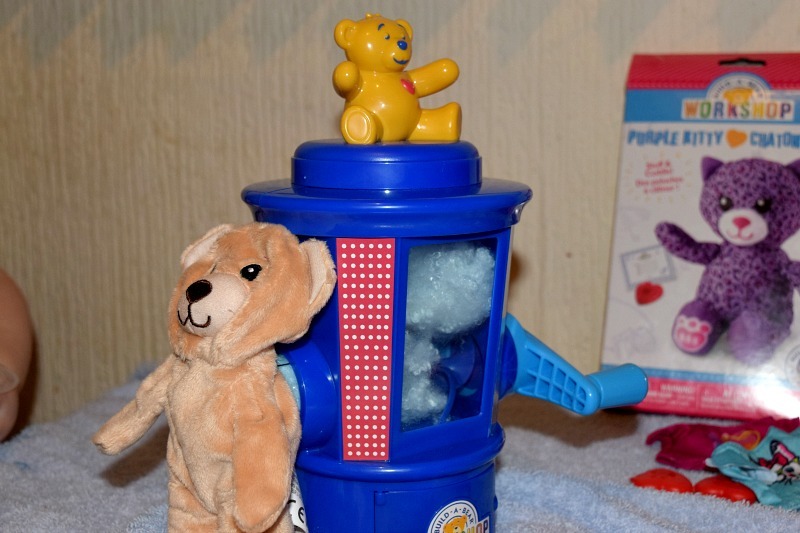 I think it is a brilliant crafty toy for children and it would make a great gift, especially with Christmas coming up. 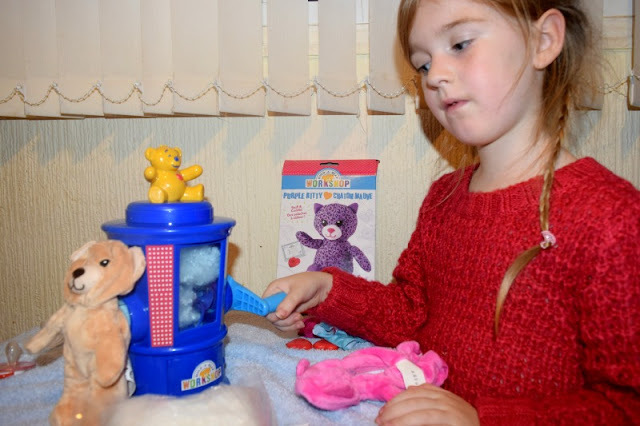 The Build a Bear Stuffing Station is available to buy from most toy retailers including Smyths Toy Stores and Toys R Us.